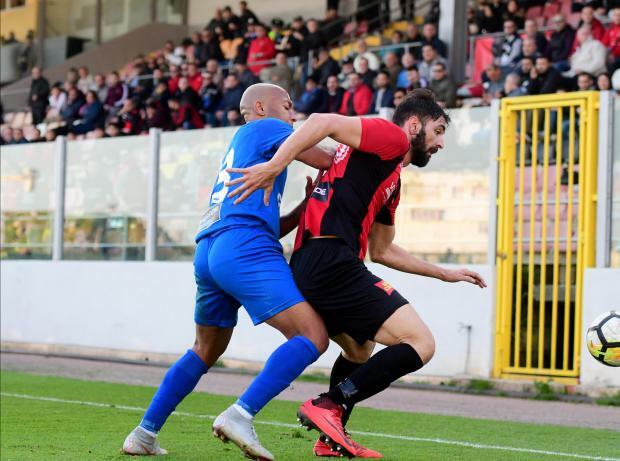 Ħamrun survived the second-half dismissal of Kevin Tulimieri to see off Tarxien Rainbows at the Hibs Stadium. The Rainbows went in search of an early goal and Ħamrun goalkeeper Sean Cini was called into action after just three minutes but he deflected Siraj Arab’s conclusion from the right into a corner. The Spartans replied with a Caetano Calil effort from the right which scraped past the post. Ħamrun were soon in control and on 21 minutes, Marco Criaco’s corner from the right was blocked by Bugeja and Enrico Pepe’s overhead kick ended high. A minute later, Domoraud served Tulimieri on the right and the latter’s low shot was saved in two attempts by the young Tarxien custodian. On 26 minutes, the Spartans managed to take the lead. Bugeja tried to chase Domoraud for the ball and the latter was quick to serve the unmarked Criaco on the left who slammed the ball home. Ħamrun maintained the pressure and eight minutes from the end of the first half, Orestis Nikolopoulos was first to Triston Caruana’s free-kick but his effort was turned into a corner by Bugeja. From the resulting corner, taken by Criaco, Domoraud hit the crossbar with a fine header. The Spartans were reduced to ten men on 63 minutes after Tulimieri picked a second yellow card for a reckless tackle. Ħamrun kept operating on counter attacks and six minutes from time, they doubled the score. Criaco’s cross was well met by Domoraud, as Mambouana failed to intercept, and the French striker controlled before slotting past Bugeja. The Rainbows looked dead and buried and two minutes from time Domoraud received a through pass on the left and served substitute Conor Borg who hit high. One minute in added time, the Spartans scored the third goal. Moukanza’s cross from the right beat the goalkeeper and Destin Prince-Prince-Loic Mambouana in a desperate attempt to clear the ball into safety placed the ball into the back of the net for an own goal.